The reliance on price lists is widespread throughout the screen printing industry, especially for new companies just getting started. A simple Google search on screen printing price lists yields literally millions of hits, so there's no shortage of price lists to choose from. The big question is which one. Again and again, screen printing teachers advise their students to come up with their pricing based on a markup of their costs and the prevailing prices for similar services in their local area. This is cold comfort, however, to people new to the industry that don't yet know how to determine their costs and don't yet have the data on what the other companies are charging. The result is often that they grab a price list that looks reasonable and just start using it, sometimes for years; sometimes until they burn out and sell their equipment on Craigslist. We strongly agree that businesses are best served by basing their pricing on their costs and what the others are charging. However, if you happen to be someone who is currently using a price list that you got from someplace else, or if you are in the process of looking for one to use right now, you can use a free Price List Tool to you help choose wisely. If you're not familiar with Microsoft Excel, using the Price List Tool and understanding the results it produces may present a challenge, but the payoff can be significant. Learning and using the Price List Tool will enable you to quickly and accurately find the inconsistencies in a price list. This means that if you've been using a price list that has problems in it, you can identify your problems, fix them and confirm that you've fixed them. It also means that if you are currently looking for a price list, you now have a tool to test the promising ones for consistency and other errors such as typos and transposed numbers. If you don't already include your screen price in your price list, you can use the Price List Tool to do this, as well, by simply putting your screen charge in a single input field. This means that it will make it easier for your customers to understand your pricing and it will eliminate any potential misunderstanding about who owns the screens after a job is done. Finally, the Price List Tool lets you to easily update your pricing. This article explains how to use it to update your pricing for just your screens, just your printing or your prices in general. This means that you can easily do "what if" scenarios on raising your pricing, and when you are satisfied with your updated pricing, you can be assured that your new price list is consistent and error free. The Price List Tool itself is a set of four tables on a single Excel spreadsheet, plus additional spreadsheets that show example price lists, one of which has consistent pricing and the other which has a number of inconsistencies. Table 1, the main table, is where you can enter your current price list's data. This table can be edited to adjust the quantity price breaks. It also provides a field for entering or removing your screen charges, and a field for increasing or reducing the price list prices by a percent amount. Figure A shows what Table 1 looks like and provides tips on how to fill it out. When using the Price List Tool, there are instructions provided next to Table 1 to guide you through the process of entering the data. As you enter data in Table 1, the Price List Tool immediately displays the calculated results in Tables 2, 3 and 4. These tables show the price per item, how the pricing changes as the quantity increases, and how the pricing changes as the number of colors increases. If you entered either a screen charge or a price adjustment, this data is incorporated into the data in Tables 2, 3 and 4. The minimum order quantity for this particular price list is 12 items. The quantity breaks are numbers; not number ranges. For example, for the first row, 12 means "from 12 to 17 items," and for the second row, 18 means "from 18 to 23 items." No data was entered in the Screen Charge field because the price for the screens for this particular price list is already included. Also, there is no data entered for several combinations of quantities and colors that the printer is not willing to produce. For example, the price list implies that there is a 24 item minimum for jobs calling for more than 6 colors, a 36 item minimum for jobs calling for more than seven colors, etc. Table 2 (Figure C) gets populated automatically from the data entered in Table 1. For this particular spreadsheet, the screen charge was already incorporated into the pricing, so the pricing for both Tables 1 and 2 are the same. 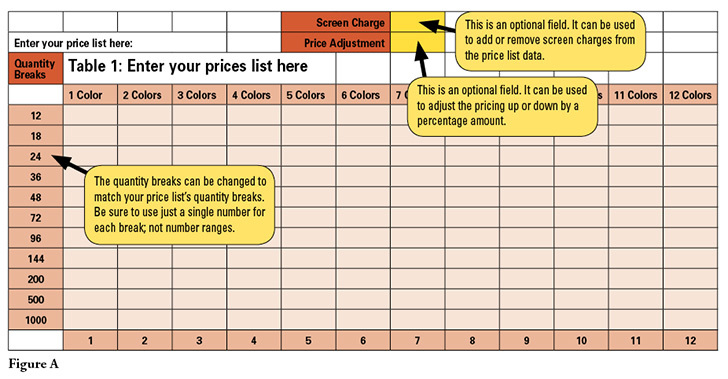 When you use the Price List Tool to evaluate a price list that specifies an additional amount for screens, entering the amount for screens in the Screen Charge field, will allow you to incorporate the screen charge into the price list itself, distributing it based on the quantity breaks and number of colors. The smooth color transition from top-to-bottom and left-to-right confirms that the pricing entered in Table 1 is consistent. It shows the prices on a per item basis. Table 3 (Figure D) shows the consistency of the price list based on the printing quantity breaks. The desired result is to have the amount charged for printing go down as the quantities go up. The way to assess the results for Table 3 is to read from the top of the column to the bottom for each of the columns. For example, Table 2 shows that 12 items printed with one color would cost $7.22 per item, and 18 items printed with one color would cost $5.73 per item. The resulting difference is $1.49. This difference represents the drop in the price list when moving from a quantity of 12 to 18 items. Note that the quantity discounts are large between 12 and 18 items, continue to decline between 18 and 24 items, and taper off for the larger quantities. There are two reasons for quantity discounts. The first is that it costs just as much and takes just as long to create the screens and set up a job for 12 shirts as it does for several hundred. So, screen printers typically provide quantity price breaks because the screen creation and set up cost can be spread across the quantity of items to be printed. The rule of thumb is that the difference on the price break diminishes as the quantities increase. The second reason for providing quantity breaks on pricing is to provide customers with an incentive to place larger orders to take advantage of the lower price per item. 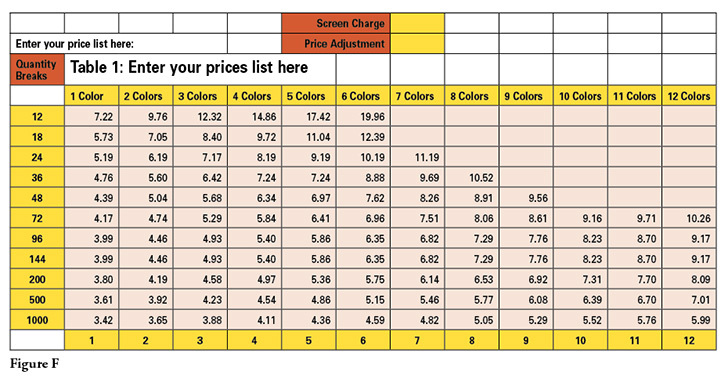 Table 4 (Figure E) shows the consistency of the price list based on the number of colors being printed. The desired result is to have the incremental amount charged for colors printed remain stable (within two or three pennies) with each additional color. The way to evaluate the results for Table 4 is to read the data from left to right on a row-by-row basis. For example, Table 4 shows the printing cost for 12 items increments at a constant rate of about $2.54 per color and the printing cost for 18 items increments at a constant rate of about $1.32 per item. In other words, the numbers on each row for Table 4 should remain the same or within two or three pennies of the same amount. The slight differences of a few pennies up or down on the amounts in Table 4 are indicative of rounding choices made in the price list. For example, the developer of the price list used in this article may have rounded all the prices either up or down to the nearest nickel. Here are some ways that you can put the Price List Tool to work for your businesses. The Price List Tool's color scaling makes it easy to spot price list errors. For example, the price list in Figure F looks just fine. When checking it using the Price List Tool, however, it becomes evident that there are pricing consistency errors for a six- and seven-color job in quantities of 36 (Figure G). It turns out that the actual error is that the price list charges the same amount ($7.24), for printing either four colors or five colors on 36 item jobs. Mistakes of this nature can easily happen, as well as transposing numbers, and other price list typos. The color range feature of the Price List Tool makes them easy to spot. Many price lists are based on printing pricing for specified quantities and colors with a separate price for screens at the bottom of the page. This makes it more complicated than need be for customers to understand what the screen printing job will actually cost and occasionally leads to a mistaken notion regarding the ownership of the screen itself. If you currently show your screen price separately and would like to switch to inclusive pricing, you can do so by entering your screen price in the Screen Charge field, which is just above Table 1 (Figure H). When you enter a screen price, the amount is automatically incorporated into the resulting price list shown on Table 2 of the Price List Tool. The Price List Tool makes it easy to increase your pricing by using the Price Adjustment field. For example, to increase your prices by 5 percent, enter 5 in the Price Adjustment field, which is just above Table 1. Your new, 5-percent higher pricing is shown in Table 2 of the Price List Tool. When you would like to increase your screen price, you can do so by entering your screen charge increase in the Screen Charge field. For example, if you currently charge $15 per screen, and want to increase your screen charge to $25, then enter 10.00 in the Screen Charge field. 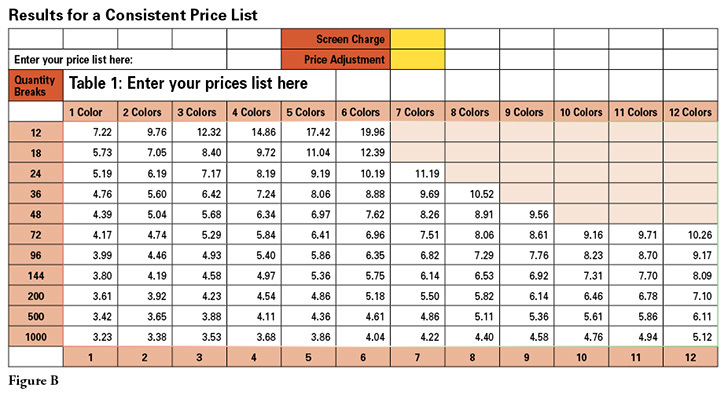 Table 2 will show your new price list with the increased amount for your screen charge. If you want to keep your screen charges the same and increase just your printing charges, you can do so as follows. Enter your current screen price in the Screen Charge field as a minus amount to remove your current screen charge from the price list. For example, if you currently charge $25 per screen, then enter -25.00 in the Screen Charge field. Copy the data from Table 2 into Table 1. Note: An easy way to do this is to copy the data and then use "Past Special | Values" to paste it. Use the Price Adjustment field to make your price increase. Copy the data from Table 2 into Table 1. Use the Screen Charge field to add back your screen charge. Your new pricing will be shown in Table 2. The Price List Tool is free and can be downloaded from www.FastAccurateBids.com/Resources. Myra Harmer and Steve Steiger are business partners at Fast Accurate Bids, a software company that helps apparel decorators get their customer bids done faster, easier, and with greater confidence in their pricing. They developed the Price List Tool as an advanced diagnostic test to help the subset of their customers who are interested in setting up Fast Accurate Bids to produce the same pricing they currently use. This article appeared in the SGIA Journal, Spring 2016 Issue and is reprinted with permission. Copyright 2016 Specialty Graphic Imaging Association (www.sgia.org). All Rights Reserved.